WASHINGTON, D.C. – April 24, 2017 – IMA World Health joins Pink Ribbon Red Ribbon, the American Cancer Society Cancer Action Network and 10 other public health organizations on Capitol Hill Tuesday to urge lawmakers to end cervical cancer deaths worldwide by integrating prevention and treatment into existing U.S. global health assistance programs. Cervical cancer is a disease that is both preventable and treatable, but kills an estimated 266,000 women each year globally. It’s also the most common cancer among women in 38 low- and middle-income countries. 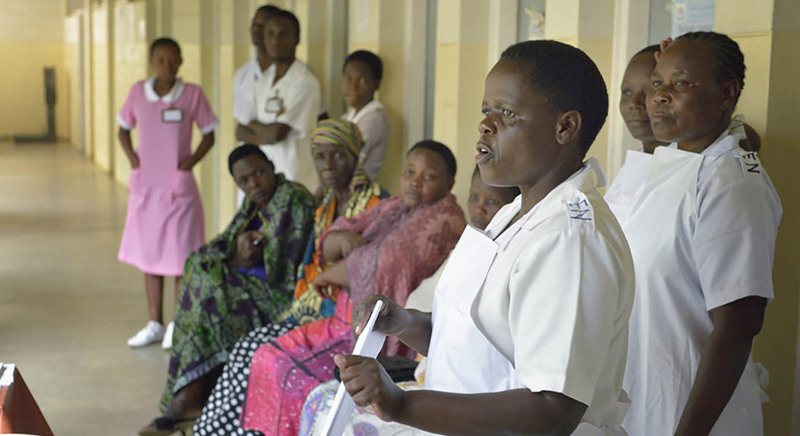 IMA World Health addresses the problem most directly in Tanzania, where the cervical cancer burden is nine times higher than the U.S. and 50 percent greater than the rest of eastern Africa. In Capitol Hill meetings Tuesday, advocates will urge lawmakers to integrate cervical cancer prevention, screening and treatment services into existing global health initiatives in LMICs. They will also ask lawmakers to include a provision in the fiscal year 2018 State and Foreign Operations and Related Programs Subcommittee appropriations bills that directs the U.S. government’s attention on a focused effort to eliminate death from cervical cancer. Today, ACS CAN, PRRR and 22 other health organizations also sent letters to members of Congress who determine foreign aid spending and to the United States Agency for International Development to encourage support for strengthening U.S. international health assistance programs to address the devastating impact cervical cancer continues to have on women and families, especially in LMICs. Read the support letters to Congress and USAID for more information. IMA World Health is a faith-based, global nonprofit that helps communities overcome their public health challenges. Founded in 1960 as Interchurch Medical Assistance, today’s IMA World Health has presence in Haiti, Tanzania, Kenya, South Sudan, Democratic Republic of Congo and Indonesia and enjoys significant local partnerships in many other countries around the world. To learn more, please visit www.imaworldhealth.org. ACS CAN, the nonprofit, nonpartisan advocacy affiliate of the American Cancer Society, supports evidence-based policy and legislative solutions designed to eliminate cancer as a major health problem. ACS CAN works to encourage elected officials and candidates to make cancer a top national priority. ACS CAN gives ordinary people extraordinary power to fight cancer with the training and tools they need to make their voices heard. For more information, visit www.acscan.org. Pink Ribbon Red Ribbon is an independent public-private partnership affiliated with the George W. Bush Institute that leads coordinated action to save women’s and girls’ lives from cancer in low-resource settings. Pink Ribbon Red Ribbon is dedicated to the delivery of services for the prevention and treatment of cervical and breast cancer. With the engagement of national governments, non-governmental and multilateral organizations, and key local leadership, the partnership builds country-owned, sustainable programs that allow women and girls to access the care they need to thrive. Pink Ribbon Red Ribbon currently support efforts in Botswana, Namibia, Peru, Zambia, Tanzania and Ethiopia. To learn more, visit: http://pinkribbonredribbon.org.